The recent passing of former Cuban leader Fidel Castro has prompted yacht designer Dickie Bannenberg to release the following drawings from his late father’s archive. 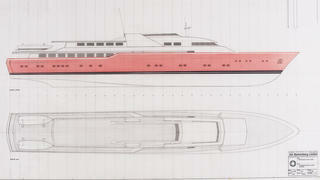 As these archive drawings show, the 61 metre superyacht would have featured bright red topsides and tender storage for two speedboats on the aft deck. An alternate design (pictured below) features a white finish with a side-loading tender garage and the Cuban flag proudly emblazoned on the superstructure. Castro had planned to commission the yacht via the government fisheries ministry Cuba Pesca and had identified fellow communist state Poland as the most likely build location for the project. However, the facilities for yacht building in Poland were later found to be inadequate for a superyacht project of this size and the plans were eventually scuttled. 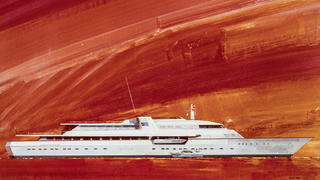 One of the most prolific and influential yacht designers of the 20th century, Jon Bannenberg worked on dozens of notable projects for venerable yards such as Feadship, Lürssen and Oceanfast. His son Dickie, director of London design studio Bannenberg & Rowell, released the retrospective Jon Bannenberg: A Life of Design in 2015.